21 year old Eunice Kadogo continued Kenya’s brilliant sprinting renaissance at the 2015 All Africa games in Brazzaville Congo. She won the silver medal in the women’s 100m. In the process she also broke the Kenya 100m record with a time of 11.47. The previous record of 11.62 was set by Joyce Odhiambo at the 1987 All Africa games. It lasted an amazing 28 years. Kadogo finished second to Marie-Josee Ta Lou of Cote’d Ivoire who won in 11.02 seconds, a new games record. This marks the first time that a Kenyan woman has won a medal in the 100m at the All Africa games.Kadogo also anchored the Kenya team that finished in a creditable 4th position in the 4 X 100m. The performance harkens back to the mid 1980s when Kenyan female sprinters were among Africa’s top sprinters. This was especially the case at the 1984 African championships when Joyce Odhiambo took silver in the 100m while Ruth Atuti and Mabel Esendi took gold and silver in the 400m. Kenya went on to win both women’s relays on that occassion. 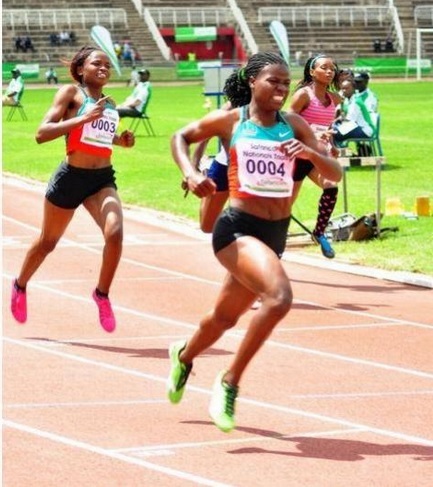 This entry was posted in Kenya Athletics News, Kenya Sports news and commentary and tagged 2015 all african games, eunice kadogo. Bookmark the permalink.